All MCPS students are required to take four years of math. In some cases students are ahead by taking Algebra courses in middle school and the higher level courses they take at the end of high school are viewed as pointless with regards to future careers. Slowly pushing through a packed hallway, a sophomore lethargically walks to math class. After working hard in middle school, he is now in pre-calculus. Whether he is interested in the subject or not doesn’t really matter; he is still legally required to make this walk for two and a half more years. In 2013 State Senators Richard Madaleno and Paul Pinsky introduced the College and Career Readiness and College Completion Act, which requires students in Maryland to be enrolled in a math class every year they are in high school and that they take Algebra 2 and all its prerequisites. 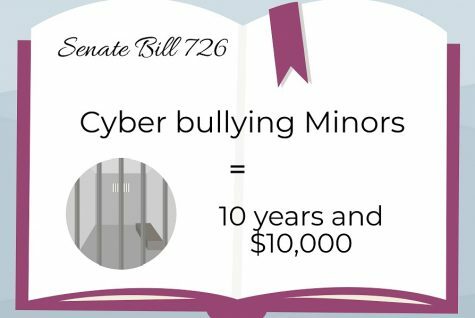 After the Maryland State Senate passed it unanimously, the bill flew through the House of Delegates and wound up on the desk of Governor Martin O’Malley. He then put pen to paper and it became law. 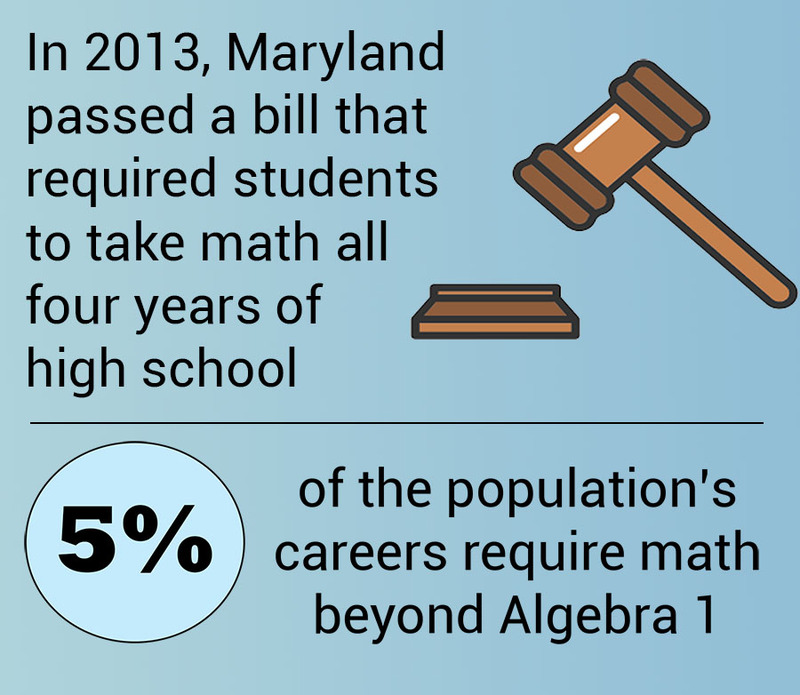 The State of Maryland should repeal the four-year requirement, which is restrictive and unnecessary, but keep the Algebra 2 requirement which is sufficient in preparing students for college and careers. The four year requirement first stemmed from large numbers of Maryland high school graduates taking remedial courses, usually meaning high school-level Algebra 1, when studying at Maryland community colleges and public universities, according to a 2013 Washington Post article. However, there are many students who have completed levels of math far beyond Algebra 1 by the time they go to college and the requirements only serve to force them into high level statistics or calculus which they may never need. Only five percent of the population needs math beyond Algebra 1 in their professional careers, according to a 2013 report by the National Center on Education and the Economy. That means that vast quantities of the other 95 percent are forced to take math classes like calculus that are completely irrelevant to their future careers. Space in a student’s schedule is valuable. Before the legislation, 90 percent of students were taking math in junior and senior years, according a May 2014 Washington Post article. The majority of students opting out of senior year math were Advanced Placement (AP) and International Baccalaureate (IB) students, filling the hole in their schedule with another advanced course, counselor Wendy Kiang-Spray said. That means that they were able to take a class and learn skills that more closely corresponded to their eventual career path. 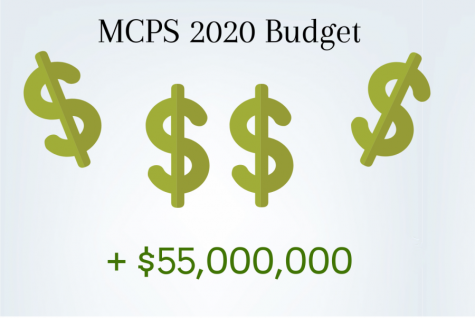 There is validity to Madaleno and Pinsky’s claim that taking four years of math can benefit students. The 2013 average score on math SATs for students who took three years of math was 439, contrasting an average score of 512 from students who had enrolled in four years of math. High SAT scores can lead to better college acceptances which can translate into better opportunities further down the line. This, however, does not justify the state pushing students into these potentially fruitless math classes. It is simply something that counselors need to inform students of, if they plan to take fewer than four years of math. Algebra 2 is considered the gateway to calculus. It should serve as an indicator to students as to whether or not they want to and are prepared for further math education. 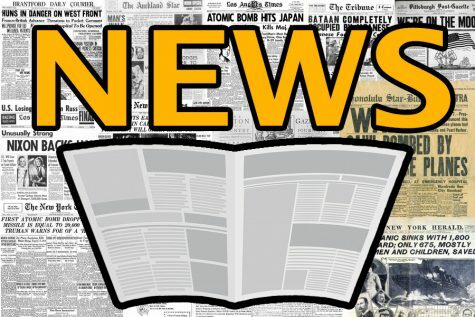 By maintaining mandated Algebra 2 and scrapping the mandated four years of high school math, the state would ensure that students have enough knowledge of mathematical concepts for college and careers without forcing them to scrap another elective in order to fulfill a frivolous math requirement. Without the four-year math class requirement, the aforementioned sophomore, lethargically and unenthusiastically walking to math class, would know that next year he can further pursue a math-related field, or take more language classes…or history, or science. Whatever choice, that sophomore would still be college and career ready.